WASHINGTON D.C., June 8, 2009 -- Hollis Country Store & Flea Market has been selected for the 2009 Best of Hollis Award in the Flea Markets category by the U.S. Commerce Association (USCA). U.S. Commerce Association (USCA) is a WashingtonD.C. based organization funded by local businesses operating in towns, large and small, across America. The purpose of USCA is to promote local business through public relations, marketing and advertising. 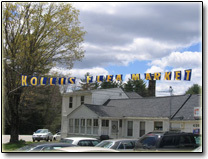 I used to go to the Hollis Flea Market when I was a kid and it always was a place I never forgot. I had not been back to there in many years as I moved a couple hours away. I always wanted to be a vendor like my Aunt and Uncle were I thought that was such a great way to meet people and make some money. It took me years to get the courage to go there to sell things. The past 2 years I have gone there selling things and it is worth my traveling a couple of hours to have a great group of vendors and owners/workers there. I look forward to it and it always makes me feel good because the owner comes around and talks with everyone. It is nice to see people that care. I make floral arrangements and wreaths etc. It was so neat to actually have people ask where I was if I missed a week. You get to know the regular vendors and customers. I hope they keep this going for many more years. I cannot wait for them to open up this year. I actually started doing this for medical reasons and have found it does help the body and mind. John you and your family, workers do a fantastic job please keep it up. Hi my name is Ed Boehm and I'd like to share my favorite Hollis Flea Market memory. 20 years ago as a teenager I was having trouble finding a baseball cap that would fit over my enormous head. I grew up in Greenville and heard that the Hollis Flea Market had vendors that supplied specialty items that could not be found anywhere else. So on one warm Sunday morning I set out on my bike to tackle the 15 mile journey to the HFM. Once I arrived I was amazed at how many vendors were selling so many different items. I was filled with anticipation that for the first time in my life I too may be able to wear a ball cap that fit on my huge melon. I knew that all the ridicule that I had endured throughout my youth was about to be erased. I searched up and down the rows of tables looking for the peddler who could free me from my self imposed prison with no success.............. Just when I thought I had come so far only to be disappointed once again....there he was.....set up next to the sock table under a huge pine tree. Baseball caps of all sizes and colors. A tremendous amount of joy rushed over me when I found the size 13XXX in the mauve color that I desperately dreamt about!!!!!!!!! I purchased that cap along with 3 pairs of knee high tube socks from the sock lady that morning. That afternoon after eating 4 chili dogs and drinking 3 cokes which were purchased at the HFM as well, I started my long trek back to Greenville. I rode with my huge cranium held proudly towards the sky with a big smile plastered to my face. The kids at Mascenic High never teased me about my ill fitting hats again!!!!!!!!!! I've traveled back to the HFM hundreds of times since that experience and am not embarrassed to say that a tear of joy comes to my eye every once in a while upon my arrival. Thank you Hollis Flea Market..........You changed my life!!!!! "My Father had had his Stamp Collection and First Day Covers set up at the Hollis Flea Market. My brother & I had a great time being there with him. Spending our Sundays running around with other Flea Market kids. We had friends that we looked forward to seeing each week. It is a great memory!!! All the toys, candy and food. The memories make me want to come back to see what it's like now!" "I remember going to the Hollis Flea market for my first time in July 1970. It was all a one sided flea market back then.The parking lot was on the same side as the flea market. The other side of the street was trees only. However in June 1978,when i was fifteen,I visited the Hollis Flea market again and I remembered how it had somewhat grown. It was still a one sided flea market but I can recall how the other side of the street now had the main parking lot there along with the Flea Barn. As of 1979,I began going to the flea market off and on from that year all the way up until 2003. I must say it has grown tremendously since 1980. 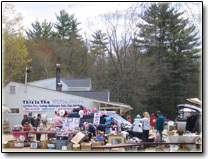 In 1980 dealers started setting up on the same side as the Flea Barn which was the beginning of Brad and Dona's Flea market. I am not into collecting like I was through the years which is why I have not been to the flea market however I feel that after a few years of being away,it would be joyuful to revisit a flea market that i have greatly enjoyed through the years." "One of my best childhood memories is early Sunday mornings at the Hollis Flea Market with my family, collecting baseball cards, steamed hot dogs... makes me want to go there right now." – Toby Arsenault, 36, Lyndeborough NH. "I have taken my bike down to the Hollis Flea Market nearly every Sunday as long as I can remember; I always come home with a bargain and full belly. The thought of fresh fried dough gets me up in the morning"
"As a lifelong resident of Hollis, 75% of everything I own I bought at the Flea Market. I love the dealer who sells Under Armour shirts. Thanks for the great memories not to mention bargains"
"I am proudly a Hollis Lifer and also fondly recall my childhood spent at the market. I bought my first bike, baseball glove, stereo, and beanie baby at the flea market. I even went on my first 'date' (5th grade) at the Hollis Flea market. Thanks for the great memories"
"My mom and I rented a space at the Hollis Flea Market last summer (June 2006),we cleaned out the garage, attic and basement. We gathered/priced all our items loaded them in a truck and headed down to the market. It was the first time we had ever set up a booth at flea market... what a great experience! Everyone was extremely helpful and professional. We were set up by 7:00am and had sold everyone of our items by noon. I was in shock. We even sold one shoe! (true story) Mom and I had a great day of bargaining and we even did some shopping of our own. Thanks for the great flea market experience can't wait to do it again"! "I can remember going to church in the morning with my parents then heading over to the flea market. My dad would get a coffee, and as a treat for being good in church, my sisters and I would each get a hot chocolate and a donut. Seems like just yesterday, only now I take my kids to the flea market for hot chocolate and donuts"! 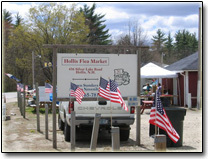 "As I hiked the Application Trail (summer 2004) I often wore my favorite Hollis Flea Market T-shirt (only have two) and was shocked how many people had heard of or had been to the flea market. And they always seemed to have a warm story about the place and would be a good conversation starter so I kept wearing them. Now when I take my Sunday flea stroll, considerable less than the 2,100 mile AT, I think about the friends I made while wearing a simple HFM t-shirt. Thanks! P.S. John, when are the 2007 t-shirts coming in? "My first time to the HFM was quite an adventure as I had only been in the country a few weeks. I came over from England to teach and work at a summer camp in the lakes region, our first field trip was to the HFM. I had been to flea markets back in UK so was familiar with a proper market. We all had a great day of antiquing, eating fried dough (as we don't have fried dough back home) and chasing camp kids it turns out to be one of my first vivid America memories. That day I bought a 19th century French Armoire which still sits in my parlor. I fell in love with the area, got married and now 20 years later still visit the market when I can, this time with my own children!" 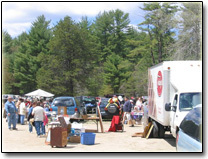 If you have a similar success story about the Hollis Flea Market that you would like to contribute to our page, please e-mail us at john@hollisflea.com.